Gartersnake.info was born of a realization that accurate information about the care of garter snakes in captivity was badly needed. First launched in 2004, it has existed in a semi-unfinished state ever since. Jonathan Crowe grew up in Winnipeg, Manitoba, where he began keeping Red-sided Garter Snakes at the age of eight. 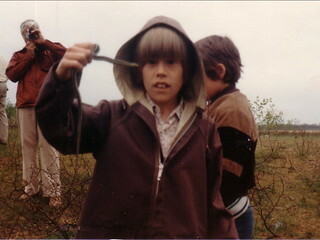 Here’s a picture of him from that period, mucking around at the snake dens near Narcisse, Manitoba. After a long hiatus, Jonathan got back into snake keeping with a vengeance in 1999; a year later, he picked up where he left off as a child with his first love: garter snakes. He currently lives in Shawville, Quebec, with his partner, Jennifer Seely, their two cats, and more than two dozen snakes, at least a third of which at any given time are garter snakes. Jonathan is also the author of The Map Room, a blog about maps, and DFL, a blog about last-place finishes at the Olympics. The information presented on this website is the product of the research and first-hand experience of the authors, and is, to the best of our belief and knowledge, correct. But we’re not professional herpetologists, veterinarians or zookeepers, and we could be wrong. Our experiences may not match yours. There’s a lot about garter snakes, and snakes in general, that hasn’t been discovered yet. We’re trying our best, here, and we’re not knowingly providing false information, but please keep that in mind. Gartersnake.info uses technologies, including cookies, to customize content and advertising, provide social media features, and analyze traffic to the site. Information about your use of this website is shared with social media, advertising and analytics partners. This section outlines those technologies and how they’re used. Advertising. Third-party companies (i.e., Amazon.com and Google) serve ads on this site; these companies may use information (not including your name, address, e-mail address or telephone number) about your visits to this and other sites in order to provide advertisements about goods and services of interest to you. If you would like more information about this practice and to know your choices about not having this information used by these companies, click here. Contacting me. If you contact me via email, your email address will not be disclosed except if I forward your message to someone who might be able to answer your question. The contents of your email will only be posted online with your permission. Social media. This website makes use of social media buttons from Facebook, Google Plus and Twitter. These buttons make use of embedded code provided by the social media companies that I have no control over. If you’re logged in to one of these social media networks, they will be able to present information on this website based on your data (friends, likes, et cetera), which I don’t have access to. For more information on social media and privacy, see the privacy policies of Facebook, Google Plus and Twitter. Tracking. This website uses Google Analytics, which gives me access to non-personalized aggregate data about who visits this site (such as how many visit from Canada, or use Chrome, or use a mobile device). Information like this helps me understand what works and doesn’t, why people are visiting, and what parts of the site need working on. I don’t get any information about individual visitors. Learn more about Google Analytics and privacy, and how to opt out of Google Analytics. Turning off cookies. If you object to the use of these data, one option is to turn off cookies in your web browser. (See the privacy settings in your preferences.) Turning off cookies should block tracking by third parties, but because Disqus relies on cookies to function, you will also be unable to comment on blog posts. For more information on cookies, see the Wikipedia entry.